Camarasaurus (/ˌkæmərəˈsɔːrəs/ KAM-ə-rə-SAWR-əs) was a genus of quadrupedal, herbivorous dinosaurs. It was the most common of the giant sauropods to be found in North America. Its fossil remains have been found in the Morrison Formation of Colorado and Utah, dating to the Late Jurassic epoch (Kimmeridgian to Tithonian stages), between 155 and 145 million years ago. Camarasaurus presented a distinctive cranial profile of a blunt snout and an arched skull that was remarkably square. It likely travelled in herds, or at least in family groups. The name means "chambered lizard", referring to the hollow chambers in its vertebrae (Greek καμαρα/kamara meaning "vaulted chamber", or anything with an arched cover, and σαυρος/sauros meaning "lizard"). Camarasaurus is among the most common and frequently well-preserved sauropod dinosaurs. The maximum size of the most common species, C. lentus, was about 15 meters (49 ft) in length. The largest species, C. supremus, reached a maximum length of 23 meters (75 ft) and maximum estimated weight of 47 tonnes (51.8 tons). The arched skull of Camarasaurus was remarkably square and the blunt snout had many fenestrae, though it was sturdy and is frequently recovered in good condition by paleontologists. The 19 centimeter long (7.5 in) teeth were shaped like chisels (spatulate) and arranged evenly along the jaw. The strength of the teeth indicates that Camarasaurus probably ate coarser plant material than the slender-toothed diplodocids. Each front limb bore five toes, with the inner toe having a large sharpened claw. Like most sauropods, the front limbs were shorter than the hind legs, but the high position of the shoulders meant there was little slope in the back. Serving the purpose of weight-saving, as seen in other sauropods, many of the vertebrae were hollowed out, or pneumatic; that is, the vertebrae were riddled with passages and cavities for an intricate system of air sacs connected to the lungs. This feature was little understood at the time Camarasaurus was discovered, but its structure was the inspiration for the creature's name, meaning "chambered lizard". The neck and counterbalancing tail were shorter than usual for a sauropod of this size. Camarasaurus, like certain other sauropods, had an enlargement of the spinal cord near the hips. Palaeontologists originally believed this to be a second brain, perhaps necessary to co-ordinate such a huge creature. Indeed, while it would have been an area of intensive nervous system—probably reflex, or automatic—activity, it was not, however, a brain; and such enlargements are frequently found to some degree in vertebrate animals. Camarasaurus lewisi and C. grandis both had more robust radii than fellow sauropod Venenosaurus. The scientific classification of Camarasaurus, using the Linnaean system, is given in the box to the upper right but, among palaeontologists, this method of taxonomic classification of dinosaurs is being supplanted by the cladistics inspired phylogenetic taxonomy. Camarasaurus is considered to be a basal macronarian, more closely related to the common ancestor of all macronarians than to more derived forms like Brachiosaurus. The first record of Camarasaurus comes from 1877, when a few scattered vertebrae were located in Colorado, by Oramel W. Lucas. Pursuing his long-running and acrimonious competition (known as the Bone Wars) with Othniel Charles Marsh, the paleontologist Edward Drinker Cope paid for the bones and, moving quickly, named them in the same year. 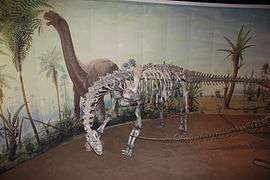 For his part, Marsh later named some of his sauropod findings Morosaurus grandis, but most paleontologists today consider them to be a species of Camarasaurus . Such naming conflicts were common between the two rival dinosaur hunters, the most famous being Brontosaurus and Apatosaurus. It was not until 1925 that a complete skeleton of Camarasaurus was recovered, by Charles W. Gilmore. Because, however, it was the skeleton from a young Camarasaurus, many illustrations from the time show the dinosaur to be much smaller than it is now known to be. The type species of Camarasaurus is Cope's original species, C. supremus (meaning "the biggest chambered lizard"), named in 1877. Other species since discovered include C. grandis ("grand chambered lizard") in 1877, C. lentus in 1889, and C. lewisi (originally described as a new genus Cathetosaurus) in 1988. C. supremus, as its name suggests, is the largest known species of Camarasaurus and one of the most massive sauropods known from the late Jurassic Morrison Formation. Except for its huge size, it was nearly indistinguishable from lentus. C. supremus was not typical of the genus as a whole, and is known only from the latest, uppermost parts of the formation. Both grandis and lentus were smaller as well as occurring in the earlier stages of the Morrison. Stratigraphic evidence suggests that chronological sequence aligned with the physical differences between the three species; and it describes an evolutionary progression within the Morrison Formation. C. grandis is the oldest species and occurred in the lowest rock layers of the Morrison. C. lentus appeared later, co-existing with grandis for several million years, possibly due to different ecological niches as suggested by differences in the spinal anatomy of the two species. At a later stage, C. grandis disappeared from the rock record, leaving only lentus. Then lentus too disappeared; at the same time supremus appeared in the uppermost layers. This immediate succession of species, as well as the very close similarity between the two, suggests that C. supremus may have evolved directly from C. lentus, representing a larger, later-surviving population of animals. Camarasaurus lewisi species was originally named as Cathetosaurus lewisi and later synonymized with Camarasaurus. A 2013 analysis split the two genera again. There is a fossil record of two adults and a 12.2 meter (40 ft) long juvenile that died together in the Late Jurassic epoch, approximately 150 million years ago (in northeast Wyoming, United States). [note 1] It is assumed that their bodies were washed by a river in spate (flood) to their final resting place in alluvial mud. The scenario suggests that Camarasaurus traveled in herds or, at least, in family groups. At other sites fossil camarasaur eggs have been found in lines, rather than in neatly arranged nests as with some other dinosaurs, which suggests that, like most sauropods, Camarasaurus did not tend its young. Previously, scientists have suggested that Camarasaurus and other sauropods may have swallowed gastroliths (stones) to help grind the food in the stomach, regurgitating or passing them when they became too smooth. More recent analysis, however, of the evidence for stomach stones suggests this was not the case. The strong, robust teeth of Camarasaurus were more developed than those of most sauropods and were replaced on average every 62 days (M. D'Emic et al. ), indicating that Camarasaurus may have masticated food in its mouth to some degree before swallowing. Other findings indicate that Camarasaurus preferred vegetation different from other sauropods, allowing them to share the same environment without competing. Long-bone histology enables researchers to estimate the age that a specific individual reached. A study by Griebeler et al. (2013) examined long bone histological data and concluded that the Camarasaurus sp. CM 36664 weighed 14,247 kilograms (15.7 short tons), reached sexual maturity at 20 years and died at age 26. The first known complete skeleton, C. lentus, in "death pose"
A Camarasaurus pelvis recovered from Dinosaur National Monument in Utah shows gouging attributed to Allosaurus. In 1992, a partial Camarasaurus grandis skeleton was discovered at the Bryan Small Stegosaurus Quarry of the Morrison Formation near Canon City, Colorado. This specimen preserved a partial right humerus catalogued as DMNH 2908 as well as associated vertebrae from the back and tail. In 2001, Lorie McWhinney, Kenneth Carpenter, and Bruce Rothschild published a description of a pathology observed on the humerus. They noted a juxtacortical lesion 25 by 18 cm wide made of bone that resembled woven fibers. Although woven bone forms in accessory dental bone, in other locations it is a sign of injury or illness. The woven bone's "undulating fibrous bundles" were observed oriented in the direction of the M. brachialis. The lesion's fusion and lack of porosity at its near and far ends indicate the periostitis was inactive or healed. McWhinney and the other researchers argued that this injury would have been a continuous source of hardship for the animal. It would have exerted pressure on the muscles. This pressure would have compressed the muscles' blood vessels and nerves, reducing the range of motion of both the limb's flexor and extensor muscles. This effect would have hindered the M. brachialis, M. brachoradialis, and to a lesser degree the M. biceps brachii to the lesion's position on the humerus. The researchers inferred that the inflammation of the muscles and periosteum would have caused additional complications in the lower region of the forelimb as well. The lesion would also have caused long-term fasciitis and myosistis. The cumulative effect of these pathological processes would have moderate to severe effects on the ability of the limb to move and "made everyday activities such as foraging for food and escaping predators harder to accomplish." Hypertrophic osteoarthropathy – Although this was ruled out by the presence of the spur-like process. Osteoid osteoma – But this wouldn't explain the spur or osteoblastic reaction. Shinsplints or tibial stress syndrome – A possible origin, as many symptoms would be held in common, but shinsplints wouldn't explain the spur. Myositis ossificans traumatica (circumscripta) – Possible, but unlikely source. Avulsion injury – McWhinney and the other researchers considered an avulsion injury caused by "repetitive overexertion of the muscles" to be the most likely source for the lesion on the humerus. The researchers believed the lesion to have originated with the avulsion of the M. brachialis causing the formation of "a downward sloping elliptical mass". The bone spur was caused by an osteoblastic response following a tear at the base of the M. brachioradialis caused by its flexor motion. The Morrison Formation, situated along the eastern flank of the Rocky Mountains, is home to a fossil rich stretch of Late Jurassic rock. A large number of dinosaur species can be found here, including relatives of Camarasaurus such as Diplodocus, Apatosaurus and Brachiosaurus; but camarasaurs are the most abundant of the dinosaurs in the formation. There have been a number of complete skeletons recovered from Colorado, New Mexico, Utah, and Wyoming, usually found in stratigraphic zones 2-6. According to radiometric dating, the Morrison sedimentary layers range between 156.3 million years old (mya) at the base, to 146.8 mya at the top, which places it in the late Oxfordian, Kimmeridgian, and early Tithonian stages of the Late Jurassic period. It's environment is interpreted as semiarid with distinct wet and dry seasons. 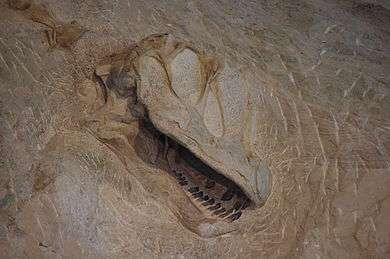 Dinosaur and trace fossils are found particularly in the Morrison Basin, which stretches from New Mexico to Alberta and Saskatchewan and was formed when the precursors to the Front Range of the Rocky Mountains started pushing up to the west. Eroded material from their east-facing drainage basins was carried by streams and rivers and deposited in swampy lowlands, lakes, river channels and floodplains. The formation is similar in age to the Solnhofen Limestone Formation in Germany and the Tendaguru Formation in Tanzania. In 1877 it became the center of the Bone Wars, a fossil-collecting rivalry between early paleontologists Othniel Charles Marsh and Edward Drinker Cope. The Morrison Formation records an environment and time dominated by gigantic sauropod dinosaurs such as Barosaurus, Diplodocus, Apatosaurus, Brontosaurus, and Brachiosaurus. Dinosaurs living alongside Camarasaurus included the herbivorous ornithischians Camptosaurus, Dryosaurus, Stegosaurus and Othnielosaurus. Predators in this paleoenvironment included the theropods Saurophaganax, Torvosaurus, Ceratosaurus, Marshosaurus, Stokesosaurus, Ornitholestes; and Allosaurus, which accounted for up to 75% of theropod specimens, and was at the top trophic level of the Morrison food web. Camarasaurus is commonly found at the same sites as Allosaurus, Apatosaurus, Stegosaurus, and Diplodocus. Other organisms in this region included bivalves, snails, ray-finned fishes, frogs, salamanders, turtles, sphenodonts, lizards, terrestrial and aquatic crocodylomorphans, and several species of pterosaur. Early mammals present were docodonts, multituberculates, symmetrodonts, and triconodonts. The flora of the period has been revealed by fossils of green algae, fungi, mosses, horsetails, cycads, ginkgoes, and several families of conifers. Vegetation varied from river-lining forests of tree ferns, and ferns (gallery forests), to fern savannas with occasional trees such as the Araucaria-like conifer Brachyphyllum. ↑ Excavated by the Division of Vertebrate Paleontology of the University of Kansas Natural History Museum and Biodiversity Center, during the 1997 and 1998 field seasons. ↑ Benton, Michael J. (2012). Prehistoric Life. Edinburgh, Scotland: Dorling Kindersley. pp. 270–271. ISBN 978-0-7566-9910-9. ↑ Foster, John (2007). Jurassic West: The Dinosaurs of the Morrison Formation and Their World. Indiana University Press. pp. 201, 248. ISBN 978-0-253-34870-8. ↑ "Forelimb", Tidwell, Carpenter, and Meyer (2001). Page 148. ↑ "Camarasaurus grandis," Foster (2007). Page 204. ↑ Mateus, O., & Tschopp E. (2013). Cathetosaurus as a valid sauropod genus and comparisons with Camarasaurus. Journal of Vertebrate Paleontology, Program and Abstracts, 2013. 173. ↑ Wings and Sander (2006). ↑ Griebeler, EM; Klein, N; Sander, PM (2013). "Aging, Maturation and Growth of Sauropodomorph Dinosaurs as Deduced from Growth Curves Using Long Bone Histological Data: An Assessment of Methodological Constraints and Solutions". PLoS ONE. 8 (6): e67012. doi:10.1371/journal.pone.0067012. ↑ "Camarasaurus", Dodson, et al. Page 56. 1 2 "Introduction", McWhinney, Carpenter, and Rothschild (2001); page 365. 1 2 3 4 5 6 "Abstract", McWhinney, Carpenter, and Rothschild (2001); page 364. 1 2 3 4 5 "Description", McWhinney, Carpenter, and Rothschild (2001); page 367. 1 2 3 4 "Conclusions", McWhinney, Carpenter, and Rothschild (2001); page 376. ↑ "Description", McWhinney, Carpenter, and Rothschild (2001); page 369. 1 2 "Description", McWhinney, Carpenter, and Rothschild (2001); page 370. ↑ "Description", McWhinney, Carpenter, and Rothschild (2001); pages 370-371. ↑ "Discussion", McWhinney, Carpenter, and Rothschild (2001); pages 373-373. ↑ "Discussion", McWhinney, Carpenter, and Rothschild (2001); pages 373-374. ↑ "Discussion", McWhinney, Carpenter, and Rothschild (2001); page. 374. ↑ "Discussion", McWhinney, Carpenter, and Rothschild (2001); pages 374-375. ↑ "Camarasaurus supremus," Foster (2007). Page 201. "Abundances and Diversities," ibid. Page 248. ↑ "Appendix", Foster (2007). Page 328. ↑ Foster, John (2007). "Allosaurus fragilis". Jurassic West: The Dinosaurs of the Morrison Formation and Their World. Bloomington, Indiana: Indiana University Press. pp. 170–176. ISBN 978-0-253-34870-8. OCLC 77830875. Cope, E. D. (1877a). "On a gigantic saurian from the Dakota eopoc of Colorado". Palaeontological Bulletin (25): 5–10. Cope, E. D. (1877b). "On Reptilian remains from the Dakota Beds of Colorado". 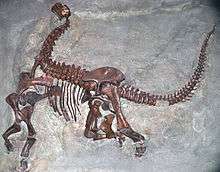 Paleontological Bulletin (26): 193–197. Cope, E. D. (1877c). "On Amphicoelias, a genus of Saurians from the Dakota epoch of Colorado". Proceedings of the American Philosophical Society (17): 242–246. Cope, E. D., 1878, On the vertebrata of the Dakota Epoch of Colorado: Paleontological Bulletin, n. 28, p. 233-247. Cope, E. D., 1879, New Jurassic Dinosauria: American Naturalist, v. 13, p. 401-404. Marsh, O. C., 1877, Notice of New Dinosaurian Reptiles from the Jurassic Formation: American Journal of Science, 3rd series, v. 14, p. 514-516. Marsh, O. C., 1878a, Notice of New Dinosaurian Reptiles: American Journal of Science, 3rd series, v. 15, n. 87, p. 241-244. Marsh, O. C., 1878b, Principal Characters of American Jurassic Dinosaurs, Part I: American Journal of Science, 3rd series, v. 16, p. 411-416. Marsh, O. C. (1889). Comparison of the principal forms of the Dinosauria of Europe and America. American Journal of Science. 37. pp. 323–331. Holland, W. J., 1919, Report on Section of Paleontology: Annual Report of the Carnegie Museum, For 1919, p. 38. Holland, W. J., 1924, Description of the Type of Uintasaurus douglassi HOLLAND: Annals of the Carnegie Museum, v. 15, n. 2-3, p. 119-138. Osborn, H. F.; C. C. Mook (1921). "Camarasaurus, Amphicoelias, and other sauropods of Cope". Bulletin of the Geological Society of America. 30: 379–388. Elinger, T. U. H. (1950). "Camarosaurus annae-a new American sauropod Dinosaur". The American Naturalist. 84: 225–228. doi:10.1086/281626. Jensen, J. A. (1988). "A fourth new sauropod dinosaur from the Upper Jurassic of the Colorado Plateau and sauropod bipedalism". Great Basin Naturalist. 48 (2): 121–145. McIntosh, J. S., Miller, W. E., Stadtman, K. L., and Gillette, D. G., 1995, The Osteology of Camarasaurus lewisi (Jensen, 1988): Brigham Young University, v. 41, p. 73-116. McIntosh, J. S., Miles, C. A., Cloward, K. C., and Parker, J. R., 1996, A New Nearly Complete Skeleton of Camarasaurus: Bulletin of Gunma Museum of Natural History, n. 1, p. 1-87. Dodson, Peter & Britt, Brooks & Carpenter, Kenneth & Forster, Catherine A. & Gillette, David D. & Norell, Mark A. & Olshevsky, George & Parrish, J. Michael & Weishampel, David B. The Age of Dinosaurs. Publications International, LTD. ISBN 0-7853-0443-6. Foster, J. (2007). Jurassic West: The Dinosaurs of the Morrison Formation and Their World. Indiana University Press. Wings, Oliver; Sander, P. Martin (2007). "No gastric mill in sauropod dinosaurs: new evidence from analysis of gastrolith mass and function in ostriches" (PDF). Proceedings of the Royal Society B. 274 (1610): 635–640. doi:10.1098/rspb.2006.3763. PMC 2197205 . PMID 17254987. Retrieved 2009-07-24. Wikimedia Commons has media related to Camarasaurus.